Blame It on Bath is the second book in Linden's The Truth About the Duke series. The events in the book run mostly parallel to the events in Book One, One Night in London. Gerard de Lacey is the youngest of the three de Lacey brothers who will lose their position within aristocratic circles if they can’t prove false the claim that their father’s marriage to their mother was a bigamous union. As the third son, Gerard has always expected to make his own way, albeit cushioned by his status as the son of a duke and personal gifts of good looks and charm. With a successful military career behind him, he expects to marry wealth. Since that expectation now has a greater likelihood of being fulfilled if he finds a bride before the scandal concerning his possible illegitimacy spreads beyond London, he is prepared to find a wife soon. But he is not prepared for the mysterious woman who approaches him and proposes he marry her. Katherine Howe, the plain daughter of an acknowledged beauty, is determined that her second marriage not be as miserable as her first. Her first husband, a profligate who wasted her dowry and borrowed large sums from her father, was neglectful and at times abusive. Her father stipulated as a condition of the loans that they be repaid in the event of Katherine’s widowhood. Her husband’s heir, who knows that repaying the loans will bankrupt his estate, is pressuring Katherine to marry him. Her mother, who doubts her graceless daughter can do better, adds to the pressure. When Katherine hears the rumors of the de Lacey illegitimacy, she remembers a young man who was once kind to her and conceives her outrageous plan, a plan that will free her from another boring, repressive marriage and give Gerard de Lacey the fortune he needs. Once Gerard accepts Katherine’s proposal, he takes charge. He confronts the heir and Katherine’s mother with a fait accompli. The heir is furious, but Mother is delighted with the connection to the Duke of Durham. Clearly she’s untroubled by the rumors. Gerard has planned to go to Bath in search of the person who blackmailed his father, and the only change his marriage makes is that Katherine, whom he insists on calling Kate, will now accompany him. The mystery thread continues, but the heart of the book is the making of a marriage between charismatic Gerard and contained Kate. The two discover shared pleasure in bed, but physical intimacy does not translate to emotional intimacy. The test of the marriage is whether Gerard can allow Kate inside his private world before he loses her. I’m a fan of marriage of convenience stories, and this is a good one. Kate is one of my favorite kinds of heroine, the woman who begins as quiet and unassuming who develops confidence and an awareness of her worth. I loved Katherine become Kate, watching her discover the difference the right clothes made in her looks and in her feelings about herself. The novel is as much about Kate’s self-discovery as it is about her and Gerard falling in love. But all the growth that takes place is not Kate’s. Gerard transforms from a carelessly kind charmer into a man who can see beyond the surface and recognizes that a “quiet glow” is more valuable that attention-grabbing sparkle. I found the changes in both more credible because they take place gradually, sometimes accompanied by regression into former attitudes. And I cannot say how happy I was that what could have been a Big Misunderstanding instead results in these two people talking to one another. Would that we saw that more frequently in romance! Fans of the first book who are eager to see the mystery of the blackmailer solved may be disappointed that so little progress is made on that front. 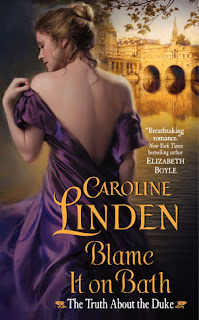 But I’m sure all will be revealed in The Way to a Duke’s Heart, scheduled for release on August 28. I am eagerly awaiting the solution to the mystery and even more eagerly anticipating seeing Charlie fall in love. Great review! Can't wait to read this one. Thank you for your review. I know I will enjoy BLAME IT ON BATH. This sounds like a great book, I will have to back up and get the first one though. I'm glad that Gerard wakes up before losing the treasure that found him. Both Kate and Gerard sound like they grow up and become better people. I will have to check this series out. Great review, I read the first book, now I need to get this one too. great review! The book soumds really good. I am sold on this one...plain and unassuming heroines winning the ultimate rogue's heart usually make great romance. Since Devil in Winter by Lisa Kleypas I enjoy this kind of HR. Thanks for another wonderful review, Janga! Ditto what Dianna said--this sounds great and I want to get the first one, too. Janga, you say this one runs parallel to the first. Is it similar to the Compass Club by Jo Goodman in that sense? Thanks, all, for your kind words about the review. I do think that this is a series that needs to be read in order, so I suggest reading One Night in London first. I recommend both. Andrea, it's been a while since I read the Compass Club books, but I think it has more overlapping than does Linden's series, which is truly parallel rather than intersecting. I'm not sure how the time frame of Charlie's book will fit with the others. Great review! Love the cover, must check this book out. Sounds really good. Wonderful review, Janga, you never dissapoint! I really do love the marriage of convienence trope and this sounds like a good one. I will definetely plan to read it in order as that is my MO with most series! Geez....I meant Janga, sorry, I'm such a geek! Thanks for the great review, Janga. I have been lucky enough to have visited Bath when my family and I lived in Paris. It is a beautiful area chock full of historical places. I can certainly see why you named your novel Blame it on Bath! I am very much looking forward to reading your novel and I am putting it at the top of my Wish List! Thanks so much for sharing. Thanks for another great review, Janga! I enjoy Linden's writing and am looking forward to reading this series. I am waiting impatiently for this series to be finished so I can read it. I like to read the books close together so the characters and story arc stay fresh. I love the sound of BLAME IT ON BATH and look forward to reading it. Thanks for the review.